On Friday, Nick arrived. He immediately wanted to help Bug put together her dinosaur. He’d given her this gift for Christmas, but I wasn’t sure how it went together. So he asked me to wait, and we set it aside for this day. 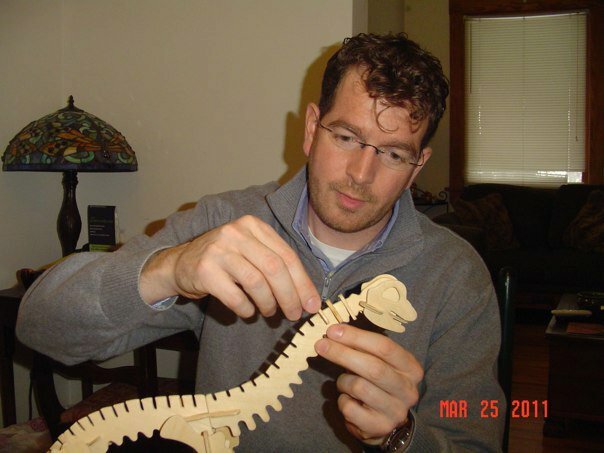 Unfortunately, Bug’s attention span didn’t really allow for much help from her on this project, but Nick seemed very content to work on it himself. And Bug loves it! 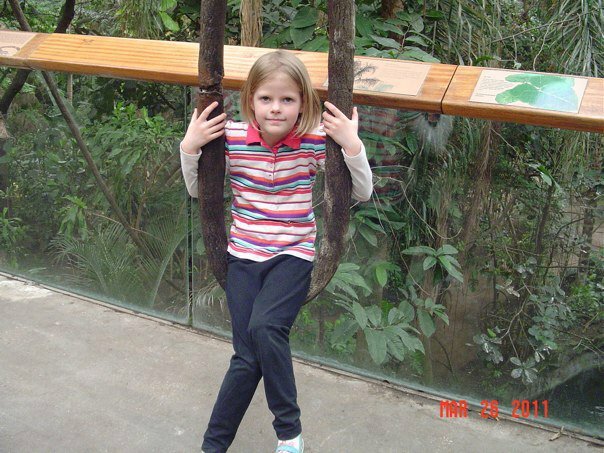 On Saturday we took Bug to the zoo. 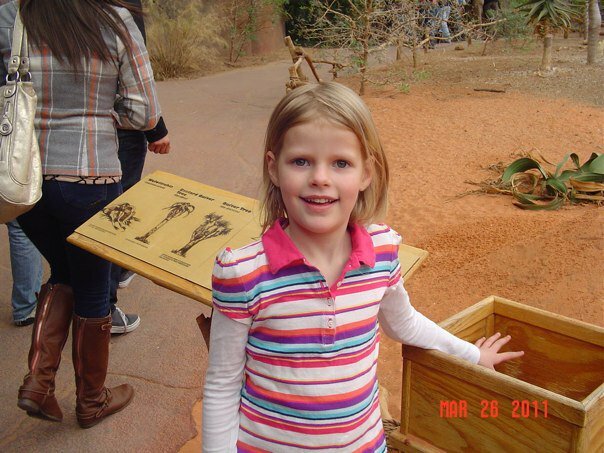 Or rather, Bug and I took Nick to the zoo. 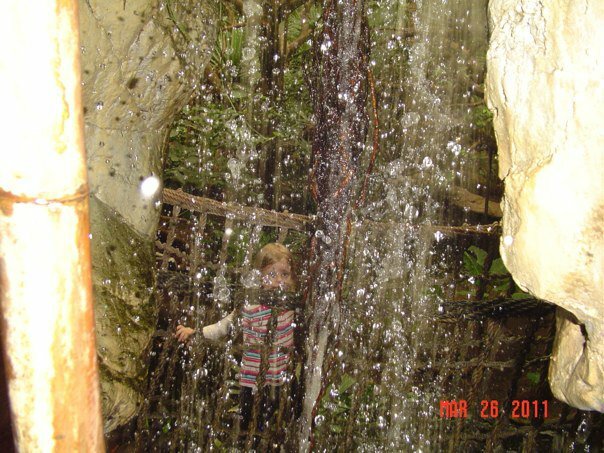 It was a miserably cold and snowy day, so we stuck to the main indoor exhibits. Bug was enjoying herself I think. There was a small glitch with my camera and I had trouble taking this picture, but I did manage to get a decent picture with Bug and Nick together. Personally, I think they both look pretty happy. And I know I am! But I feel I have a good excuse! You see, my sweetheart came to visit me for a few days, and since my time with him is so precious, I decided to leave the computer largely unused. And I assure you it was worth it! I do have a few pictures from Nick’s visit, but not many. We were too busy enjoying our time together to bother much with pictures. Though I regret that now! Not a lot of knitting either, though Saturday evening was technically a knit night. 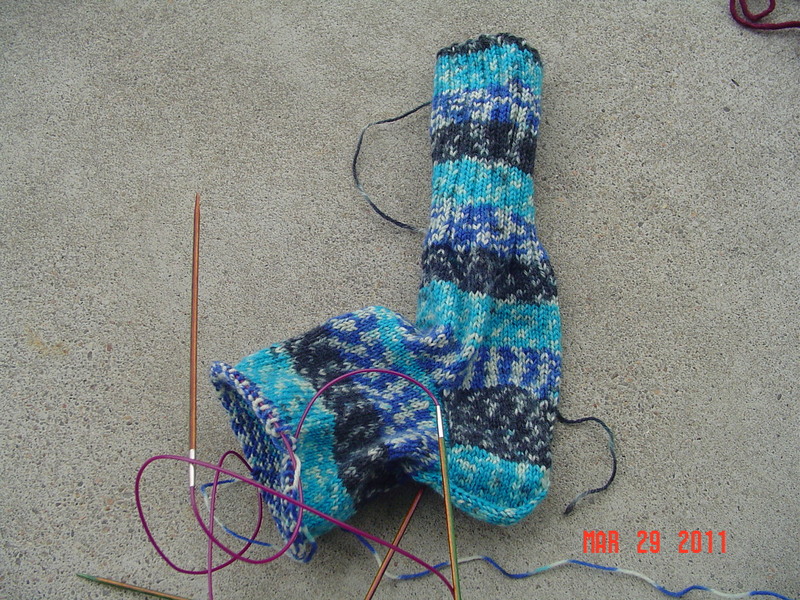 I worked on my sock. I really didn’t get that much done. We were all too busy eating, talking, and laughing. Then there is my grover jacket. I worked on this once in awhile in the quiet mornings, while I was the only one awake. I actually got a fair bit done, the shoulders are now sewn together and I’ve created the collar. 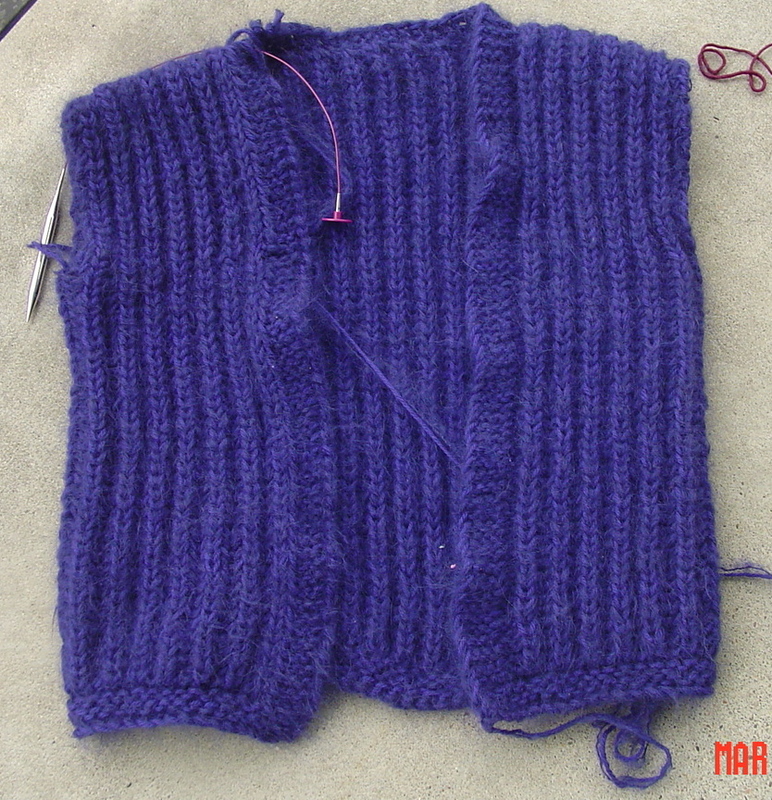 I need to kitchener it together, repair some seaming holes, and I’ll be ready to start the sleeves. On Sunday we decided to have a lovely relaxing day. We went to the bookstore so Nick could pick up a book for the trip home, and then over to The Tea Smith so that he could read and I could knit while enjoying a pot of tea. It was a most enjoyable afternoon, mostly because we’ve been imagining ourselves having an afternoon together just like this for quite some time now. I started another Sunburst Cardigan out of lambs pride worsted. The sweater is not for me, but thankfully I have more yarn in the same color since I adore it! We also hit up the yarn shop, looking for more sock yarn for socks for Nick. Today I took a picture of Nick’s sock yarn. The two on the left I already had in stash, the two on the right are the ones he picked out this trip. Parting is such sweet sorrow, and I have to admit to feeling quite down after his departure. I can’t say I’ve even wanted to knit. I am sure to feel back in the swing of things shortly! What you see here is the grover jacket. One front is finished, one front is not done at all, and the back is close to being finished. It really is coming along, even with a lost day of knitting. Yesterday I spun. I spun the remainder of the lovely, soft, plain camel laceweight. I need to ply it yet, but the end is in sight! Tonight? I will occupy myself cleaning for a bit, and then I’d rather like to spin. If I could get the plying done, I’d be feeling pretty darn good about myself! Another picture that is not the grover jacket. Before the picture, may I add that I have grover fur all over everything? In my computer, all over me, in my food, in the bathroom sink, in the bathtub. Crazy! So instead, we shall look at a sock. Done out of opal yarn, another Gentleman’s plain winter sock. Which is truly my favorite sock of all time. Yesterday, can I have a do over? Yesterday was strange. Very strange. Work went fine, it was after I got home that things got a little odd. Nothing seemed to work correctly. To begin with, we were under a tornado watch. The initial news of that happened while I was still at work. I was slightly irritated because I had wanted to get home and clean out/vacuum my car. Once I was home, I cleaned out the car, and began the vacuum process. The wind picked up and I could hear the thunder. In fact, fat drops of rain began falling as I was vacuuming the last area of the car. So I hurried to put the car in the garage, leaving the cleaning of the dash for another day. By the time I put the car away and went upstairs, the sun was back out and the thunder gone! It never did storm. So I decided to take a picture of my grover jacket so I could make a blog post. After all, I had worked on it far enough that one of the fronts was done! But, I couldn’t get a blog post up because wordpress wasn’t working. We were in read only mode last evening and that was highly frustrating. So, I decided Bug should get a bath. I knew I had a few other chores for the evening but had decided her bath time would be my little knitting break. I got her squared away in the tub, sat down to turn on netflix, and THAT wasn’t working. Couldn’t get to the website and it indicated that watch instantly was down too. Then I made the mistake of trying to keep knitting. Where I realized that the pattern was written strangely, and I had knit double the amount of stitches necessary for the front. Which means I had to frog. I had to frog FUZZY YARN! May I quickly insert a grumble about the way the pattern is written? 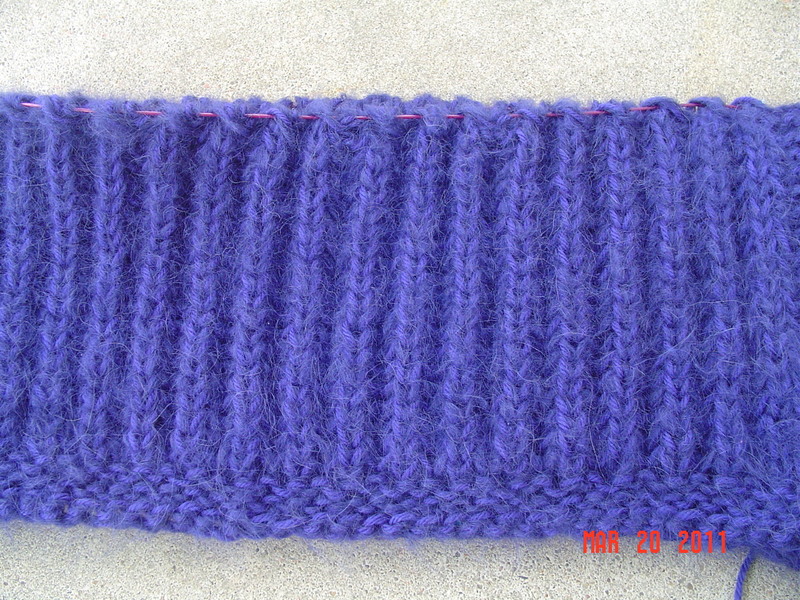 I learned with brioche stitch, or estonian patent stitches, that the YO and the slip stitch count as one unit. And I took classes, this isn’t hodge podge knowledge. But the pattern counts the YO and the slip stitch as two separate stitches! Causing my counts to be seriously off. Had I read the comments on the pattern I would have realized this, as it is covered numerous times in the comments section. I was not the only one confused by this. But I did not read the comments because generally they are all “Thank you so much for this great pattern!!!!! !” and that is just not necessary reading. FURTHERMORE…if I was the pattern creator, and I realized that this many people were having a hard time with that particular issue, I would have put a note in the pattern warning the knitter of this very trap! I don’t understand not doing so! 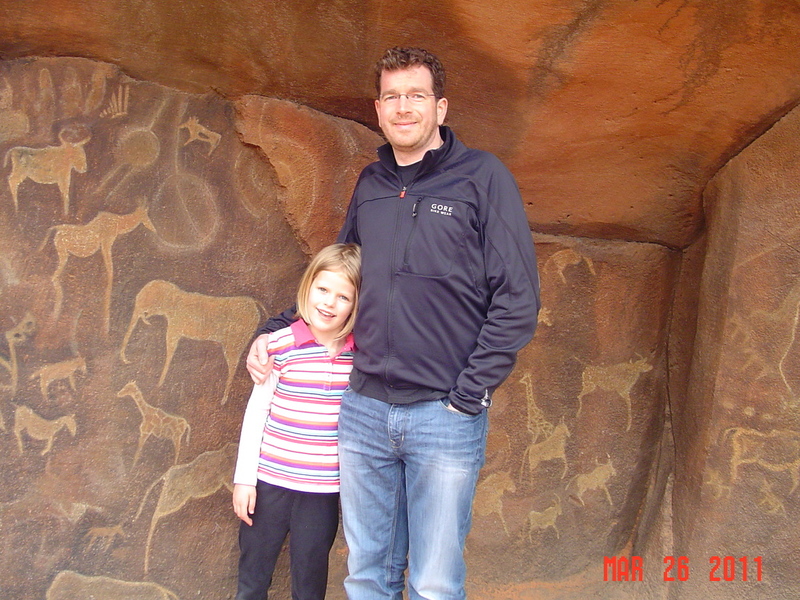 In any case…where was I? Oh, so the relaxing knitting and netflix time didn’t work out so well. I was forced to iron. Which needed to be done. But it wasn’t what I wanted to do! I suppose I can be happy that I didn’t blog about the incorrect jacket though. I’ll have a new blog post for you later, with a picture of a sock. 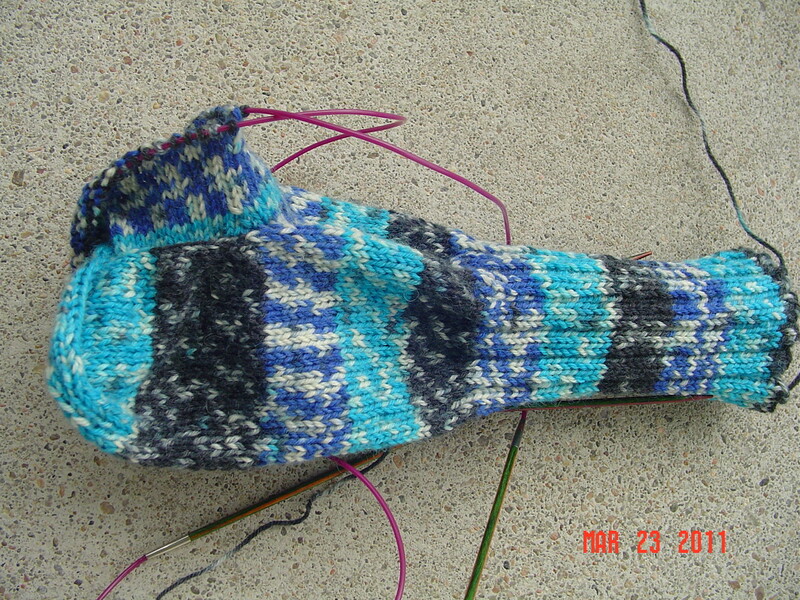 That is right, a plain boring sock I am not likely to screw up! Since I don’t care to show you the grover jacket again, as it looks no different than yesterday except perhaps to be a little longer, I will instead show you a project that has languished on the needles. 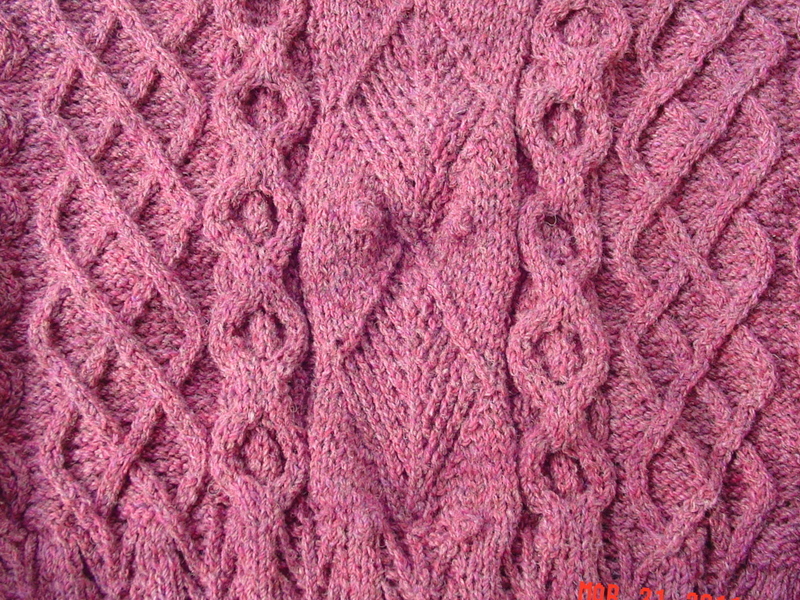 In November 2010 I started another pullover from Alice Starmore’s Aran Knitting. I was so excited that the book was released again and readily available. Prior to this, every time I knit out of this book I’d have to wait for it at the library. So I started right in on Aranmore. The yarn is from black water abbey, I got it at my first Stitches Midwest. I bought it specifically for a Starmore sweater, as the yarn really helps the intricate cables pop. It is scratchy though, very scratchy. I don’t shy away from scratchy these days, rather just find the appropriate garments to wear with it. As to why this has languished on the needles for so long? I can’t tell you. I guess I forgot just how long it takes to work the cables, following chart by chart. I’ve gotten too used to being able to rattle off a sweater in 2 weeks. 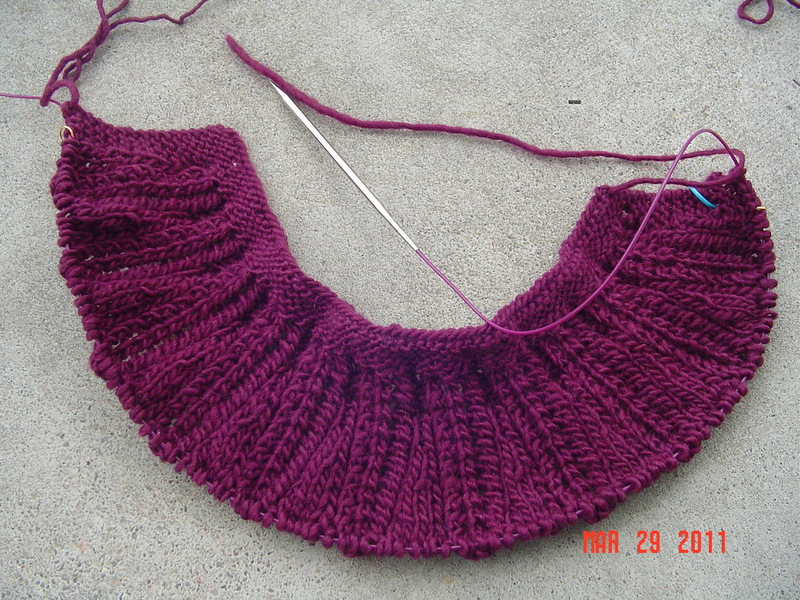 I really do intend to get back to this one in short order, even though there are tons of projects I’d love to knit! Preferably before the very hot weather hits, so that I don’t feel sweaty and scratchy all at once! Actually, now that I look at this again, I realize that I am a lot farther than I thought on it. I really need to give this one some of my time again! 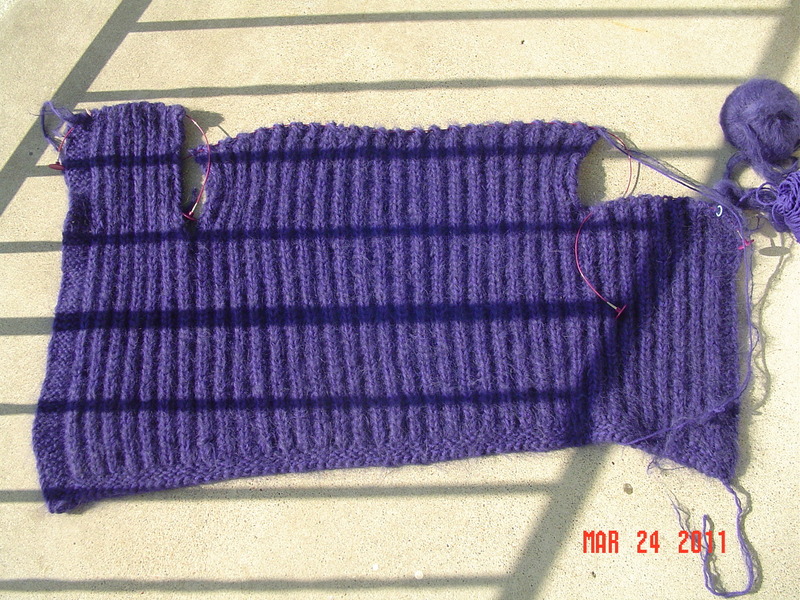 I may have been a bit swift in my desire to knit the Lavender Jacket. You see, it calls for a super bulky yarn, and it also calls for a bit of mohair to carry along with the regular yarn. So, I decided what could be better than a super bulky yarn that is already fuzzy? I chose knitpicks Suri Alpaca. 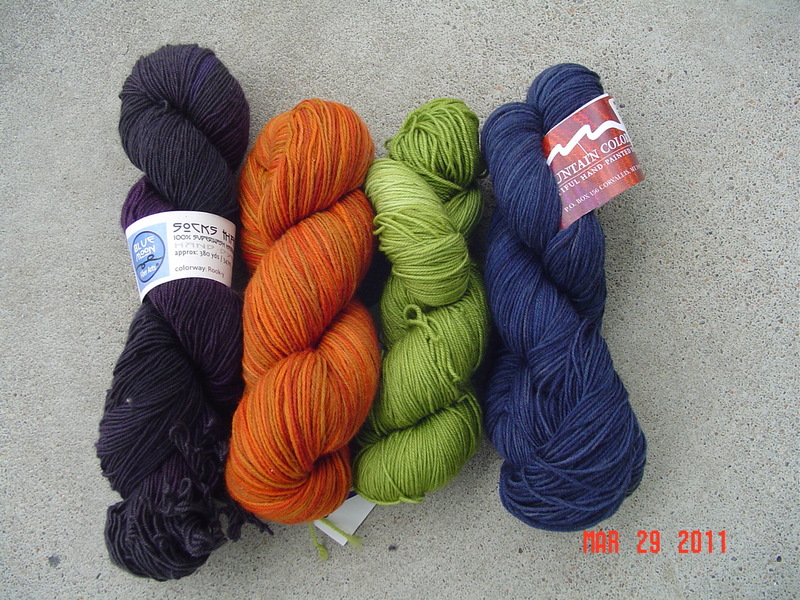 Once the yarn came, I realized that I’d still need a base yarn to knit it with, so I chose some cascade 220. Once I began, I started to think I was a little hasty in my desire to knit this, as I really feel like I am knitting Grover, with it being all crazy and fuzzy and blue/purple!